Walking with Jesus: Day 77: Mark 6:30-56 & Psalm 78 - Why Do We Need to Get Alone with God and Rest? Day 77: Mark 6:30-56 & Psalm 78 - Why Do We Need to Get Alone with God and Rest? Why Do We Need to Get Alone with God and Rest? Twice in today's passage, we see the importance of withdrawing from public ministry for time alone with God. First, the disciples were called away to spend some time with Jesus and then, later, Jesus sent the disciples away and withdrew by Himself to pray. What was the benefit of these times and what do they tell us about our needs? First, Jesus called the disciples to "Come away by yourselves to a desolate place and rest a while." This was immediately after they had returned from being sent our by Jesus to preach the Gospel of the kingdom and cast our demons. This first ministry experience had them feeling excited and it also brought them increased popularity. So many people were coming and going to see Jesus and His disciples that they could not even eat a meal in peace. 1. When we need time to process and pray about what God has been doing in our lives. 2. When we need some peace and quiet so we can think, reflect and be refreshed. 3. When we need to get away from the voices and the crowds, the busyness and even the acclaim of others, so we can hear what Jesus would say to us through His word. Second, after the feeding of the five thousand, Jesus Himself "went up on the mountain to pray." This is one of many times when we see Jesus seeking to get away from other people so He could spend time alone with His Father. Jesus wanted to do His Father's will and to please His Father in everything. Jesus enjoyed warm and close fellowship with His Father through the Holy Spirit. He often spent time alone with God the Father. 1. We are never too mature or too seasoned in the Christian life that we no longer need regular time alone with the Lord. 2. We are never too busy, too in-demand or too devoted to ministering to the needs of others to justify neglecting time alone with the Lord. 3. We need wisdom and grace, which come from intimate fellowship with our Heavenly Father. Martin Luther was a man used greatly by God to accomplish much good, often in spite of his own personal failings. 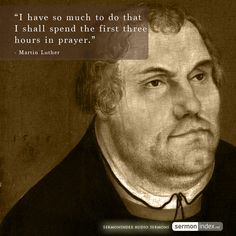 One of the keys to Luther's effectiveness in ministry was time spent in prayer. He was know to say, "I have so much to do today that I shall spend the first three hours in prayer." Luther was once asked by his barber for advice on how to pray and he wrote this little book in response. May the Lord give us the grace to be mindful of our need for time alone with Him. May we never be too busy or be fooled into being too self-sufficient to make time alone with the Lord a regular priority. Father in Heaven, when we read Your word and consider the history of Your dealings with Your people, I am amazed by Your grace and patience and persistent love and by our repeated stubbornness, selfishness and foolish rebelliousness. Over and over again, we can read in Scripture of Your people worshiping idols, committing injustice, turning their backs on You and choosing death instead of life, disgrace instead of faithfulness, worldliness instead of godliness and sin instead of You. You have repeatedly judged Your people, rebuked them for their wrongs, called them to repentance and dealt them consequences as a way of calling then back to You. But we can see these same patterns in our own lives! How many times have we chosen sin? How many times have we turned our backs on You? How many times have we listened to the world instead of heeding Your word? Father, have mercy on us! Lord, revive and restore us! Draw us back to Yourself that we may tell the generations to come of the faithful love and covenant mercies of our God! Bring us faithful shepherds who will lead us in following You. Send us God-centered, Scripture-saturated men who will proclaim Your counsels and show us Your truth. Then, give us undivided hearts to fear Your name and walk in Your ways! In Jesus' name and for the sake of Your glory we ask, Amen.